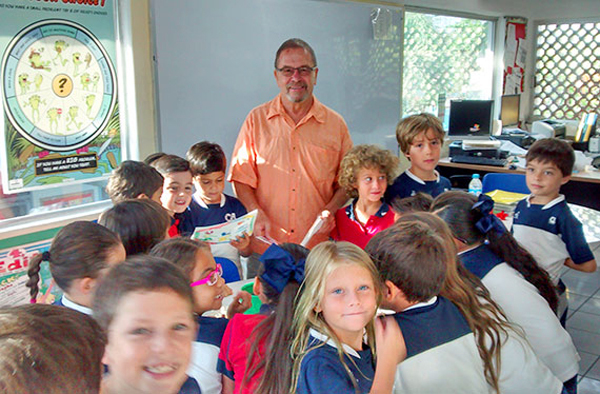 Mr. Bill is just finishing his seventh year volunteering at the American School Puerto Vallarta. Arriving from Michigan just after Halloween each year, the first phone call he makes is to ask when he can start volunteering. He is usually here two days a week from 8 until 12, but this is just a “schedule.” He always comes in when we, at ASPV, are in a bind and need an extra adult in the room! He loves working with all the kids, but is particularly good at providing advanced level math support and 5th & 6th spelling and grammar support. He has developed a history at the school and has become a part of the ASPV family. This year, he has helped a great deal in the pre-first class and has made a number of students into UNO experts. Selfless people like Mr. Bill contribute in making ASPV a very special place. Also this year, we were very lucky as he extended his stay and is still here working with us! Usually, he leaves as we break for Easter vacation. Mr. Bill earned his Bachelor of Science with a major in Philosophy from the University of Wisconsin.